We are pleased to have people visit our site and learn more about Friends of Hibou. We are all volunteers connected with the Grey Sauble Conservation Authority. We are interested in helping to maintain and upgrade the Hibou Conservation Area and have been working since 2013 to do that. Our work is on three different areas. The wetland trails, the rough shoreline, and the sandy beach area. The Wetland Trails: Educational materials remains our main focus. We have completed the new signage along the wetland trail. The brochures are located in the box under the two large signs at two different entrances. We hope to see families and school groups use this interpretive trail and learn more about wetland features right close to home. We are getting close to having the trail ready for such events. We are grateful for donations from the Kiwanis Club, the Owen Sound Field Naturalists, the Community Foundation, The GSCA Foundation, and Knapp Family. The trail runs through a protected area. The wetness of the area depends on weather, water table level and the work of the mighty beaver. 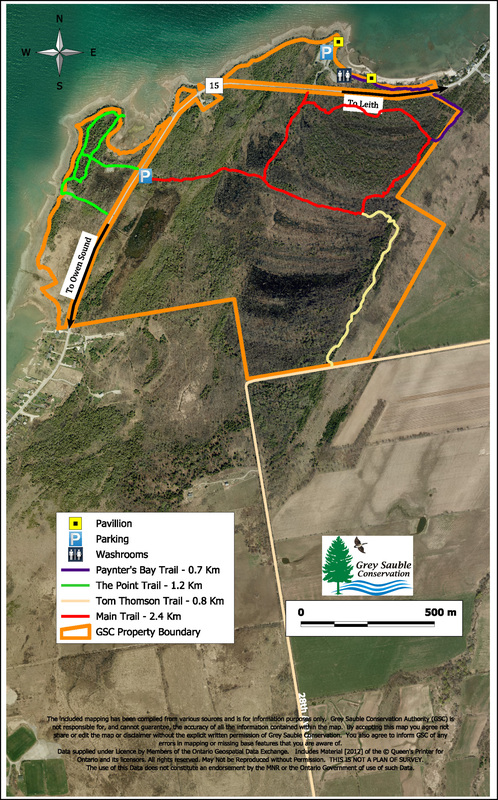 We have been working hard to build and maintain trails and boardwalks in that large area in a way that meets the Conservation Authority mandate. We will schedule a grand Opening as soon as the trail work itself is completed. It is exciting! enter Hibou. We work at keeping this area clean with no fire permits. Dogs on leash are welcome but it is NOT an off-leash area. This shoreline is natural, stony, quiet, suitable for picnics if you bring out everything you bring in including garbage. Our volunteers work at keeping the area clean and natural. Hibou sandy beach area is the most used area of Hibou. There is room for many cars to park with a small parking fee. Two picnic shelters make it useful for picnics and for shade or rain protection. In this area you will see some of the five benches we have put in for people to sit and enjoy the view and sunsets in three seasons. If you click on the map you will get a larger view. We are always looking for more volunteers to help us. Become a Friend of Hibou and get emails about up coming volunteer opportunities. Insert your email where asked in the top right column. There is no charge to become a Friend. Hibou has a total of 133 hectares with over 2 kilometers of shoreline. The sandy beach is at the north end. About 4 kilometers of trails lie mostly on the swamp side of the road. The trails are good for hiking, skiing and snowshoeing, but at times can be rather wet. A number of boardwalks cross wet portions of the trail. There is a trail that links these trails with the Tom Thomson Trail. Heading south from the sandy beach (Paynter’s Bay) there are lots of fascinating rocks. The water is shallow all along and it makes a pleasant hike. You can walk undisturbed and marvel at the water, rocks and trees.